Water, water everywhere in the Monadnock region to satisfy those who like to swim as well as those who like to fish or go boating. When we moved to Jaffrey 37 years ago, what a surprise it was to find that there were two town beaches that the Town Recreation Department manned in the summertime, including lifeguards on duty and swimming lessons. At Lake Contoocook, Jaffrey closes the road in the summer and expands the beach area. When school is back in session, they re-open the road so people can drive by and enjoy the view. Thorndike Pond provides the second Jaffrey town beach complete with picnic area. The Thorndike Pond Town Beach is directly across from one of the Monadnock State Park’s entrances, where lots of people begin their ascent of Mount Monadnock. Gilmore Pond is pristine water with limited development around the shore. There is also public access right off Gilmore Pond Road. There are no motorized boats on Gilmore Pond, but kayaking and canoeing are favorite pastimes for those who like to be out on the water. In neighboring Rindge, there is Pool Pond, Pearly Pond and Lake Monomonac, which is the largest body of water in the area. In neighboring Fitzwilliam, Laurel Lake is a wonderful cold water lake that provides great fishing, swimming and boating. In the Cathedral Estates neighborhood of Rindge all have beach rights to Emerson Pond, which is a man-made body of water. 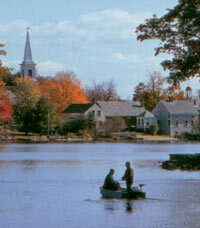 From the shores of Emerson Pond, you can hear the bells chime from the Cathedral of the Pines. Dublin Lake in Dublin, New Hampshire is beautiful. Folks from the Boston area would summer at Dublin Lake in years gone by, and there are some very large homes existing today that are part of that era. I would say that Lake Nubanusit is the most coveted body of water in the Monadnock region. So little development of the shoreline gives the properties there a much higher value. If you are interested in fun in the sun in summer and skating, snowmobiling and ice fishing in the winter, come to the Monadnock region. There are waterfront homes available and homes with beach rights, but regardless of where you settle, a lake or pond will be accessible to you. Let Despres and Associates help you find your first home, second home, waterfront home or mobile home. This entry was posted in Monadnock Region NH and tagged beaches, buying waterfront property, lakes, Monadnock Region, ponds by Shirley Despres.Bookmark the permalink.